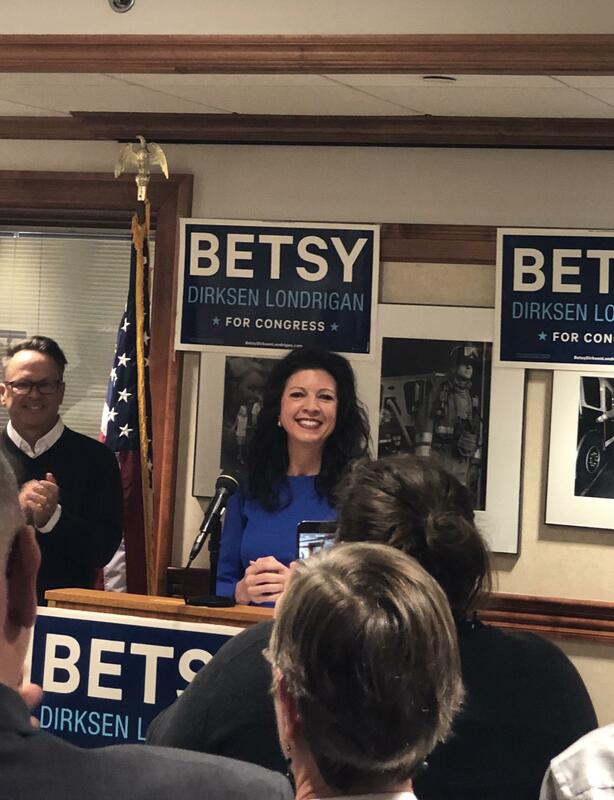 Betsy Dirksen Londrigan announces her second candidacy for the U.S. House in the 13th District on Thursday, April 11, 2019. The sprawling district stretches from the Metro East area up to Champaign-Urbana and west to include part of Bloomington-Normal. The incumbent is Republican Rodney Davis of Taylorville. Even before Dirksen Londrigan’s announcement the State GOP issued a release trying to tie Dirksen Londrigan to the far left of her party. Dirksen Londrigan said that’s not who she is. "I am a solid Midwestern Democrat. And that means we are going to continue talking about jobs. We are going to continue to talk about our kid's education, making sure that social security, and Medicare are protected, and we are going to continue to hammer on healthcare," said Dirksen Londrigan. She said it’s not too early to announce her candidacy, referencing a party line vote last week in the House seeking to end a lawsuit seeking that would end the Affordable Care Act. Davis defeated Dirksen Londrigan last November by 2,058 votes. (She actually won McLean County with 62 percent of the vote.) She she said this time she has a better shot because she is not a first-time candidate. "A lot of people who got to know us and our campaign are excited to keep going and finish what we started," said Dirksen Londrigan. Dirksen Londrigan emerged from a crowded primary field last election cycle to compete against incumbent Rodney Davis (R13). She said she wants to stand up for the middle class and Davis’ vote for the Trump administration tax bill was nothing more than a giveaway to the rich and corporate interests. “As Illinoisans this tax season have less money in their pockets they have him to thank,” said Dirksen Londrigan. Davis has staunchly defended the tax bill in the past. “We put more money in the pockets of families. That’s a good thing to do,” said Davis in 2017. Dirksen Londrigan did not take a stance on other national issues like the Green New Deal.